Nothing! The usual paper manufacturer’s logo isn’t present on the back to help date it. There is only the term “Post Card” written in 15 different languages (English being the fifth). Here is the fourth and final picture my friend Elise gave me last week. I was holding off posting it until I could figure out what uniform these guys are wearing. But I decided to share it anyway. After all, even when I think I’ve thoroughly researched a photo, I often have a reader contribute even more information. So have at it, folks! Who do you think these men are? The kepi hat makes me think gendarme, but the badge makes me think of a trolley conductor. But at least two of them appear to be wearing some sort of weapon at their hips. And would somebody as prosaic as a trolley conductor wear spats? Perhaps these are members of a military band? I’d love to hear what people think. Am I missing something obvious? Oh, and check out those dapper mustaches! What interests me here is that I am almost certain they are carrying bayonets. I have one at home, oddly enough, that looks like these and was made in Germany for the Argentine Army, in 1908. Interesting! I wonder if that clue will help solve this mystery. Thanks! No idea on this one. I love Mike’s keen eye or the detail of the bayonets. Very interesting pic! Thanks, Katherine. Funny, but after you complimented my scans a couple posts ago, I seem to be back to having things scan too red when they are sepia-toned to begin with. But unlike my old scanner, I haven’t figured out how to fix it on the new one. Oh, well, at least you can still see details fairly well. Yes, you can. Sorry to hear that you have problems with the new technology. It is my fate to always buy a faulty or temperamental printer/scanner, so know how you feel! In my case too. It took me weeks to work out that my new printer, which is also a scanner, had no draft setting to print greyscale. I wanted to save ink when knowing the copy is going to be binned after proofing. It was driving me mad trying to work it out, as I couldn’t believe a newer model would have less functionality. I finally rang the dealer who sold it to me, and he said it was deliberate as they make most of their money from the ink sales. How annoying is that!!? Oh, yes, you can easily spend more money on ink than on the printer. So exasperating. I’m quite sure, that they were WW1 corporals or sergeants of the Italian 81st infantery regiment “Torino” which in 1917 fought along the Piave river. For comparision, see https://valgraveglia.files.wordpress.com/2015/10/fanteria_1915.jpg . The number on top of their caps might have been their bataillon number. A replica of an 81st Infantery soldier’s cap is under http://i.ebayimg.com/00/s/MTIwMFgxNjAw/z/s-EAAOSwDlBTwOfx/$_57.JPG . Thank you! That’s very helpful. Those definitely look like a good match. Your information is much appreciated. 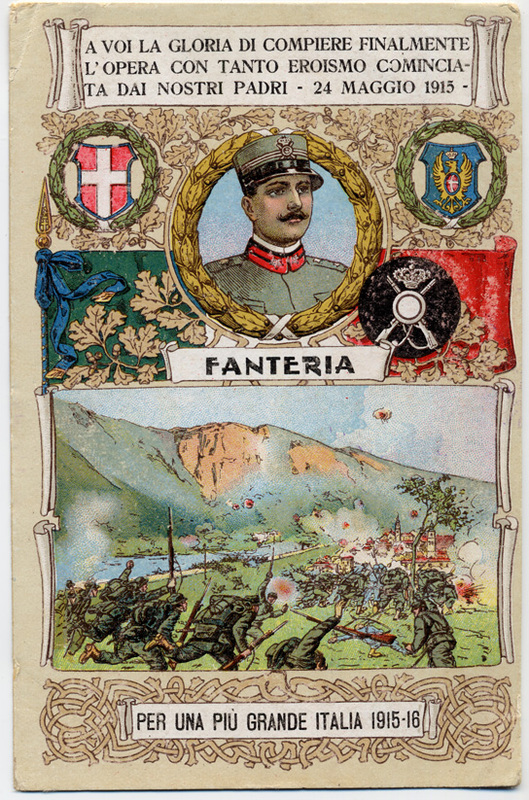 In September, 1916, two battalions of the Torino brigade, the I/81° and IV/82°, were destined for the troops grouping “Giuseppe Garibaldi”, which operated along the Val San Pellegrino between the Marmolada and Costabella rock chains and were forced to run permanent and mostly desperate attacks against the deeply entrenched Austrian and German mountaineer units in the Passo San Pellegrino. But in early March 1917, they successfully attacked and conquered the Costabella summit position held by the Austrians, with great haul of prisoners and armament. So it may be concluded, that the photograph was taken sometimes in March, 1917. Thank you, Günther! This is all wonderful information. Thank you for taking the time to look it up and share it. It adds so much to our appreciation of the image. sorry, but I have to retract a hasty conclusion. The cockades on top of the caps don’t show the batallion number but were signs of NCO candidates. So the pictured persons were members of the Italian 81st Infantery regiment but not necessarily of the mentioned 1st batallion. 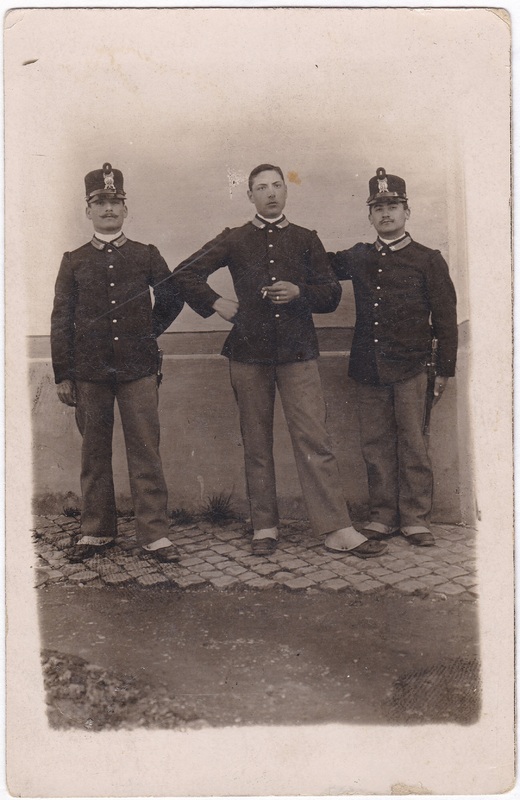 The picture under http://www.gelsumino.it/grandeguerra/Evangelista1.jpg shows an NCO candidate (studente, caporal maggiore) of the Italian 12th infantery regiment. Wonderful! Don’t worry, your initial conclusion may have not been completely accurate, but it was much closer to accurate than anything I found. This latest comparison looks exactly right. Thank you so much for taking the time to help figure this out!